Gather ‘round and give thanks! What better way to celebrate the month of giving than by giving you an app to be thankful for? 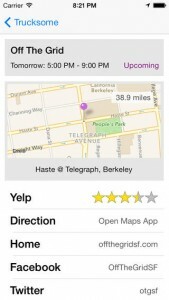 Feast your eyes (and stomach) on Trucksome – San Francisco’s premier gourmet food truck locator app. I spent some time gabbin’ and grubbin’ with none other than my fellow foodie and CEO of Trucksome Inc., Ninh Tran. 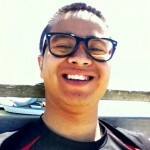 Hey Ninh – tell us about your app! 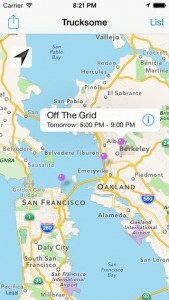 The Trucksome app is a gourmet food truck locator in the San Francisco Bay Area. Our app is easy peasy chicken squeezy! You can get directions to the nearest food truck and check out their menu, pics, Yelp reviews, follow your fav food trucks on Facebook or Twitter and even submit catering requests for upcoming events and parties. You can even add food trucks, too! Try it out! Or as we like to say…Trucksome. Get Some. Where I live in Austin, we love us some food trucks! You got a hankerin’ for BBQ and cupcakes – we got y’all covered. There used to be an amazing Austin-based food trailer park called NATY (North Austin Trailer Yard) complete with giant metal dinosaurs and crazy pink pigs. I loved it. Sadly it closed down this past July. They could’ve used the Trucksome app. Tell us about the team behind Trucksome. We have seven team members. I’m the CEO but I also manage hacks and stacks. Haoxin Li is our CTO and he manages hacks and racks. Rebecca Hui and Sandra Lee manage business development. Aaron Dear is on point for PR. Victoria Montilla is our graphic designer and Kurt Beyer, well, he’s just awesome. What process and/or people inspired or assisted you in creating the app? XCode. Engineers and PMs at Trucksome Inc., friends, family, food lovers and even customers helped us at some point in development. At Trucksome, we support each other through life, which involves coding if you're in a tech startup. What lessons did you learn building your app? I didn’t program before and now I do. Kind of. (Laughs.) In short, A LOT of lessons. Our final development release went pretty smoothly but there were definitely development challenges. Luckily our awesome dev team helped solved them quickly. What were you and the team doing before you created Trucksome? We were all students at UC Berkeley at some point in the past life. Rebecca and Sandra worked together on a great project "Apples and Wages" designed to solve food insecurity for lower income neighborhood in San Francisco. 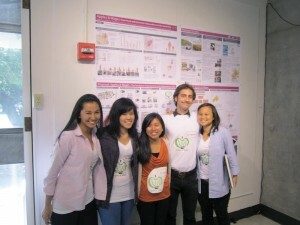 Rebecca Hui and Sandra Le started out on the Apples and Wages Student Team at Berkeley. Time to share what your favorite food apps are. I love using Trucksome, Yelp, ZAGAT, Open Table, Food Spotting, Urbanspoon, Today's Specials, and Eater. Ninh, thanks for serving us up a delicious slice of foodie fabulousness. This is now my must-have app for when I’m traveling to the Bay Area. Long live the food truck. Hey you! Wanna be featured like our friends at Trucksome? Be sure to check out www.powerslyde.com/developers.